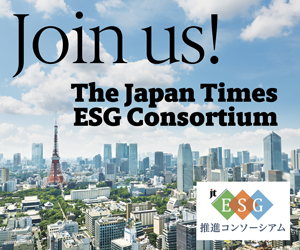 What is Japan Times ESG consortium? In the past, stock investments were based on market conditions and indicators, as well as corporate performance and fiscal issues. Today, investors are looking at environmental, social and governance (ESG) factors in analyzing corporate management for their investments. ESG investment is a new evaluation system based on non-financial information, which allows investors to grasp the mid to long-term growth potential of businesses. There has been a global trend, especially for institutional investors, to switch their long-term funds (such as pensions) to ESG-based investments. This began in 2006, when the United Nations proposed the "Principles for Responsible Investment," urging large institutional investors to include ESG aspects in their investment decisions. The bankruptcy of Lehman Brothers in 2008, as well as lessons learned from the fact that many investors pursuing short-term, high-returns, actually contributed to increasing the damage of the subsequent economic downturn, promoted the spread of ESG investing. To foresee a company's long-term growth trend, it is best to look at the "unseen values," or non-numerical values. Companies that pay sufficient attention to ESG elements are able to increase their value in the long term; this is the foundation of ESG investment. Looking at Japan, overseas investors who put a lot of weight on ESG information are frustrated by the lack of transparency in Japanese companies. Many companies have yet to improve their English communication, both in quality and quantity. This consortium aspires to provide more ESG data on Japanese companies and significantly improve the dialogue between the corporate and investment sides of business, by utilizing the capabilities of The Japan Times in information dissemination.